I know that winter is a-coming in, Christmas is fast approaching, and tomorrow is the last day of Hanukkah, but I want to continue the tradition I started last year, and I have some wonderful things to share from friends and Nothing-in-the-House alike. So without further ado, here is the Nothing-in-the-House 2012 Gift Guide for the pie baker and/or pie lover on your list. 1. Southern Pies by Nancie McDermott, $23 at your local bookstore This cookbook, written by my friend and fellow Tarheel Nancie McDermott, has been my primary source for pie recipes and inspiration in 2012. It's the book I wish I had written, with historical, traditional recipe and creative takes alike. A must-have for all pie bakers, in my book. 2. PIE. A Hand Drawn Almanac by Emily Hilliard (yes, that's me) and illustrated by Elizabeth Graeber, $15 on Etsy or at local DC-area shops I'm so excited to have collaborated with artist Elizabeth Graeber on this beautifully illustrated collection of pie stories and recipes--one for each month--from Nothing-in-the-House (plus some new ones too). It makes a wonderful gift (perhaps accompanied by a homemade pie? ), if I do say so myself. More info here. 3. A Commonplace Book of Pie by Kate Lebo, $9 on Etsy The Seattle poet, pie baker, and founder of Pie School, Kate Lebo released this dear book or pie prose poems and recipes. It includes 10 rules for eating pie, and I agree with all of them. After all, two of them read "The butter must be cold." 4. Pie Postcards by Elizabeth Graeber, $12 on Etsy or at local DC-area shops Pie Almanac illustrator Elizabeth Graeber created this set of 6 pie postcards from some of my favorite illustrations in the almanac. They are a perfect way to send pie to friends in far away places. 5. Pie Bird, $5-7 at your local kitchen store It seems that I've started a little collection of pie birds, decorative pie funnels, which are placed in the middle of a double crust pie to vent steam and juice. Though I admittedly don't really use them, they look purrrty cute all lined up on my kitchen windowsill. Read more about pie birds here. 6. Whetstone Woodenware Pie Server, $13 at Whetstone Woodenware Every pie baker needs a good pie server, particularly for lifting out those pesky first slices. My mom bought me this wooden pie server from an Amish store near my hometown, but they are also available online. 7. Vintage Pie Tins, $6-12 at your local antique store or on Etsy Vintage pie tins are another item that I've begun to accumulate. Though mine mostly serve as kitchen decor, if they are rust-free and clean, they're perfectly usable for your current pie baking. It's fun to track down their stories too; for more about this Motherlike pie tin, read here. 8. Heirloom Pie Carrier, $7-20 on Etsy or make your own A couple of months ago I got an e-mail from my friend Nathan saying that he was sending me a package of "heirlooms etc." Since he and his wife Clara are farmers, I figured he meant heirloom seeds or vegetables or jam, but what came in the mail was even more special--heirloom fabric pie carriers his grandmother made. They are of a quilted material, with 2 of the 4 sides enforced with dowel rods. They are available occasionally on Etsy, but they'd be a lovely heirloom to make and pass on to you and yours. 9. Nothing-in-the-House Winter Pie CSA, $90 (half-share) or $175 (full share), at Nothing-in-the-House Baking Co. Another shameless self-promotion here, but for all you DC locals, give the gift of pie this holiday season! 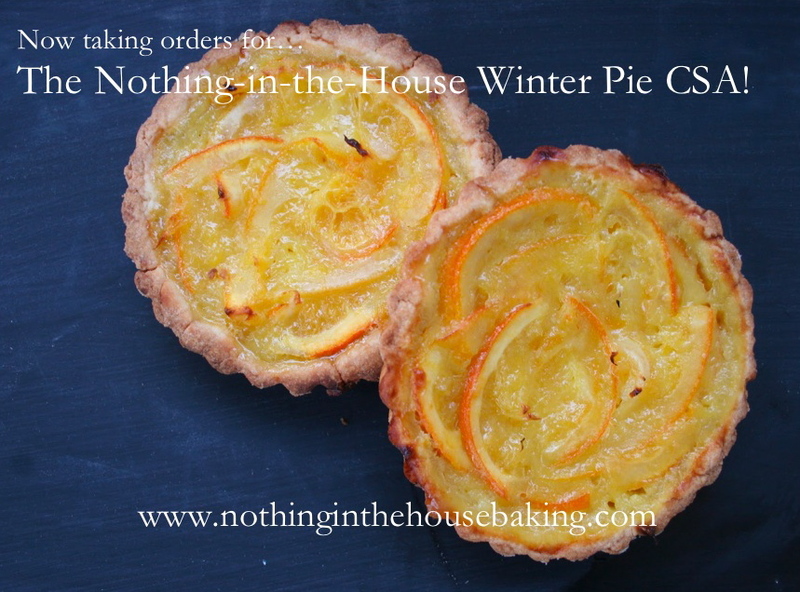 With our Winter Pie CSA, you can offer 1 or 2 seasonal, local, handmade pies a month from January through March. More info here. 10. A Donation to Pie for Connecticut: Ease the Grief, any amount, at The World Needs More Pie In times of profound tragedy, like the one that occurred yesterday at Sandy Hook Elementary School in Newtown, Connecticut, many of us are left beside ourselves unsure of what to do. We turn to our loved ones, soothing poems or music, comforting foods. To help ease the grief of those affected, Beth Howard is putting her baking skills to good use, giving away pies to the community of Newtown. Though there are many ways to help, this is a sweet one. More info here. Especially in this time of national mourning, here's wishing all of you a bit of love and joy this holiday season. And whether you find something here or not, remember that a homemade pie always makes a wonderful gift.